The following are but a few fires, accidents, and other calls that Smithfield firefighters have responded to throughout the years. This compilation is by no means complete. 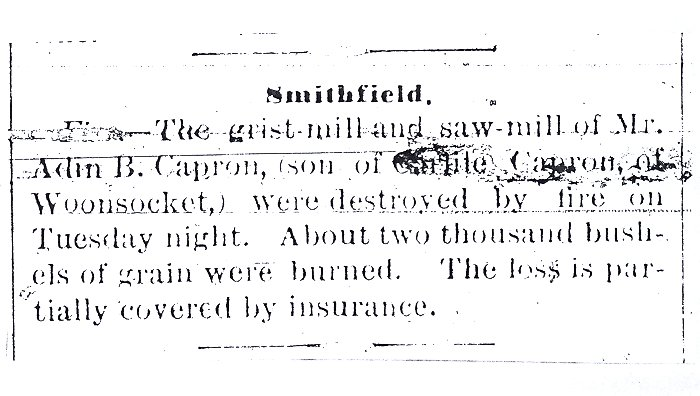 One of the earliest documented fires in Smithfield is this 1854 New York Times snippet reporting the destruction of Applebee Smith’s mill which is believed to have been located near the present-day intersection of Pleasant View Avenue and Indian Run Trail. At the time of this fire, there was no organized fire department. 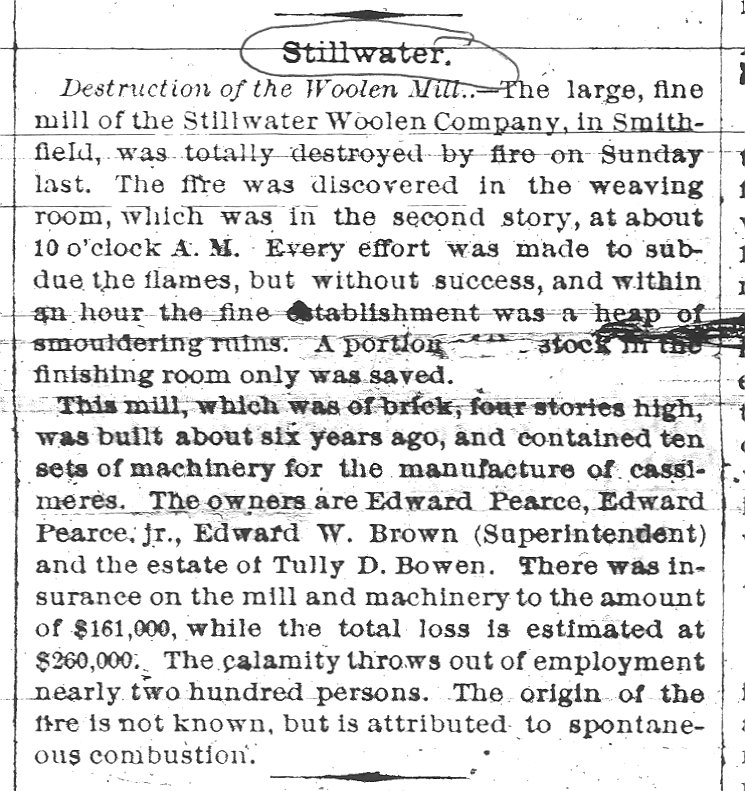 It was after this fire that it was decided better fire protection than bucket brigades was needed for Greenville, and the town’s first fire engine, The Water Witch was purchased from Pawtucket. 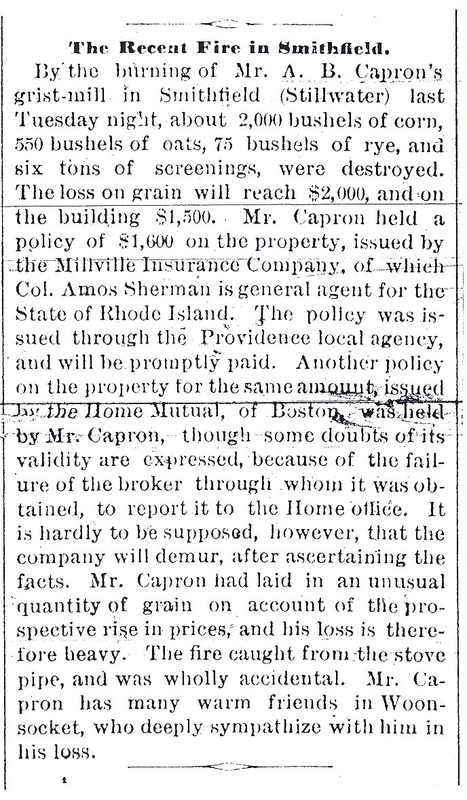 These news snippets appeared together in The Woonsocket Patriot, September 6, 1872, page 1. 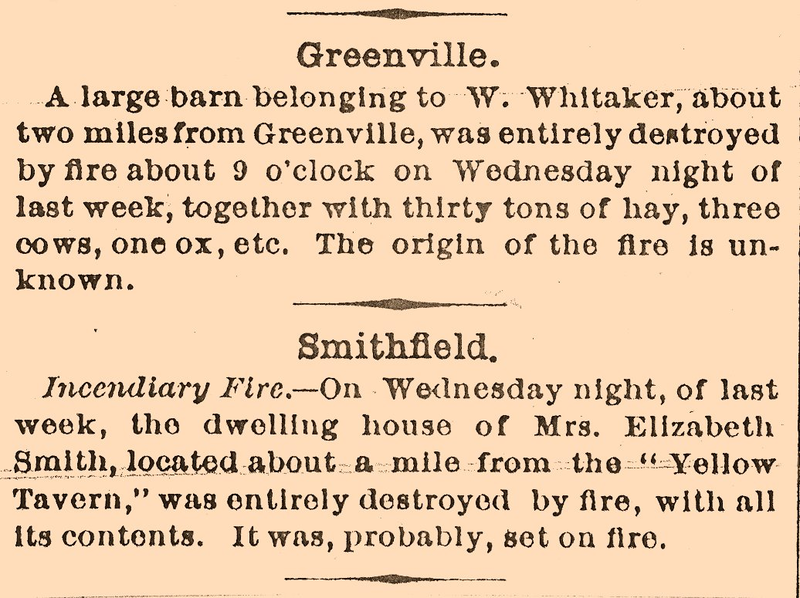 It is likely the Water Witch of Greenville saw action at one or both of these fires. (Woonsocket) Evening Call, July 29, 1897, page 3. 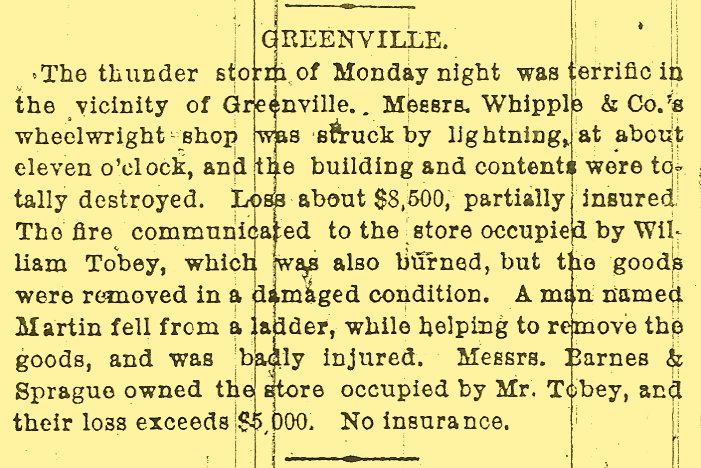 (Woonsocket) Evening Reporter, October 28, 1897, page 1. 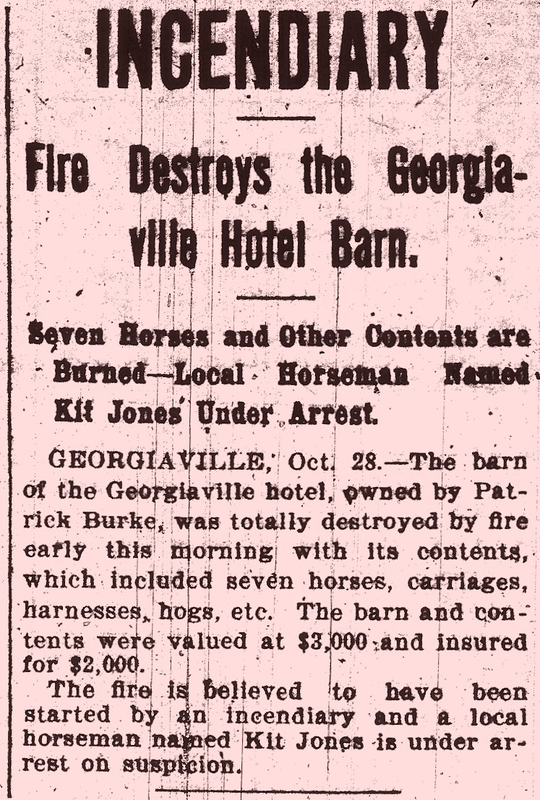 In 1897, there was no organized fire protection in Georgiaville. 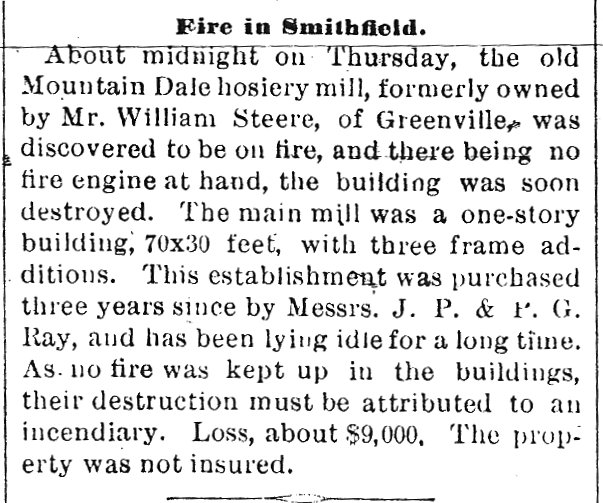 Filed Under: Articles Tagged With: Applebee Smith Smithfield R.I., Briggs and Allen Mill Smithfield Rhode Island, Capron Mill Fire Smithfield R.I., Early Fires Smithfield Rhode Island, Firefighting History Smithfield R.I., Mountain Dale Hosery Mill, Mountainndale Hosery Mill Fire Smithfield R.I., Smithfield Fire Department History, Smithfield R.I. Fire Department, Stillwater Woolen Copmpany Smithfield R.I., Whipple & Co. Wheelwright Shop Smithfield R.I.